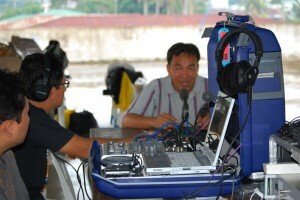 After the 2004 Asian Tsunami FEBC developed Disaster Response Radio, also known as First Response Radio. This ministry was established to provide urgent communication aid immediately following a disaster. The key is getting crucial information to stricken people. Broadcasting critical information about water, food, shelter and health for as long as necessary. This information is on-air within 3 days, and helps confused and desperate people to make it through. Distributing stockpiled radios to affected communities. Disaster Response Radio teams are ready in Indonesia, India and the Philippines. We are currently preparing teams in Cambodia and Pakistan. Your support will also help develop permanent teams in Kenya and Nepal. FEBC International is part of the First Response Radio network which adheres to the Red Cross Code of Conduct ensuring best humanitarian practice, and the CDAC Network (Communicating with Disaster Affected Communities). For detailed information on the history and present strategy of emergency radio, click here. Please click Donate, and choose from the drop-down menu: “It’s A Disaster (First Response Radio).” Thank you.